How Do Junior Golf Rankings Work? Are College Coaches Tracking the RLJGT? Click Here! Your account will be created after you hit save. This is your RecruitLook Junior Golf Tour account through our partner Signup Anytime. You’ll register and pay for all events through Signup Anytime. 4. Submit all the info needed for your golfer. You can add multiple golfers if you have multiple kids wanting play. 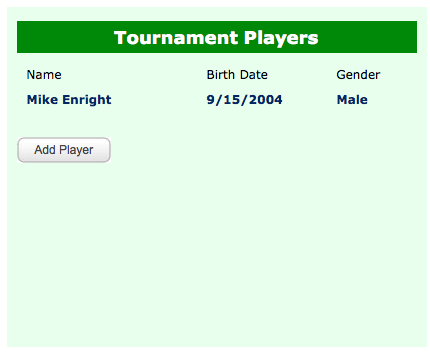 After you enter the info, your golfer(s) will appear on your profile. See image. 5. Go back to the “Tournament Schedule” (green button) to begin selecting the events you wish to play in. *Remember that each golfer has to pay a Membership Fee of $125 to play on the RecruitLook Junior Golf Tour. That $125 will automatically be applied to your first event, and you’ll never have to pay it again for the current year of the Tour.